It was a perfect 11 when Chelsea thrash Brighton earlier today. 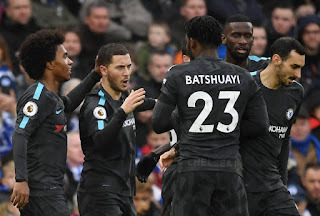 The combination of both Hazard, Michy and Willian was so on point that everyone was wondering why Conte hasn't been playing them together all this while. With Alvaro Morata suspended, Michy Batshuayi was handed a start. The Belgian did not find the net at Brighton but who got two goals during the game was full of praise for the Number 23. After the game Eden Hazard was interviewed by Sky Sport and this was what he had to say. "We started the game very well. The combination between Michy, Willian and me and the midfield was brilliant we need the more like this week after week. "But then after the first-half we had a problem. Willy made some saves today. When you score early then you think the game is really over, but it is not." "At the end of the game we won by 4-0, that's good". Concerning reaching a milestone of 100 career goals in English top flight, this was what Hazard had to say. "It's my job to score, I know it's has not happened lately but every game I try to score, create goals and assists." "That's what strikers try to do every game."